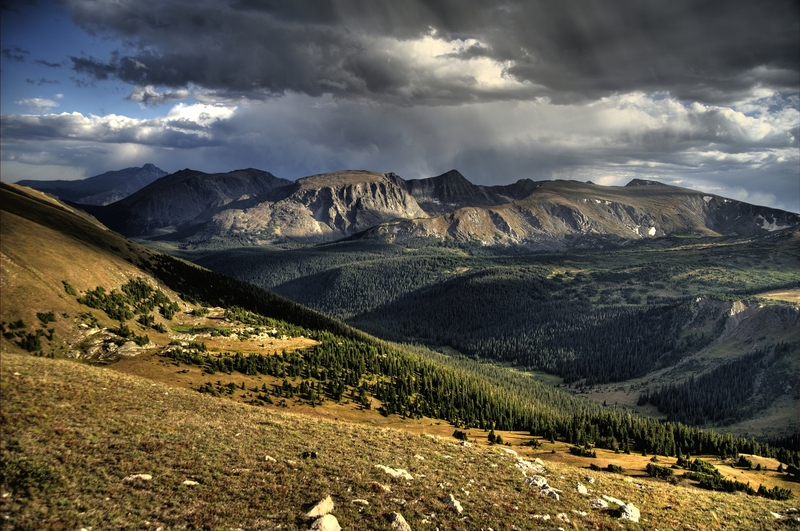 Humans have wandered the landscapes of the Rockies for thousands of years, and evidence within Rocky Mountain National Park indicates visitors as far back as 11,000 years ago – long before President Woodrow Wilson ordered the park into law in 1915. Neither those early natives nor the first European explorers would ever have imagined that the Front Range of these Rocky Mountains would one day exhibit one of the most abrupt changes of scenery to be encountered anywhere in the world. From the mile-high elevations along the western edge of the Great Plains, the Front Range suddenly climbs to more than twice that in a long, straight rampart. Rocky Mountain National Park protects a particularly impressive section of this range, including some 60 peaks with elevations exceeding 12,000 feet. Many believe that Rocky Mountain must be the highest of these peaks to explain its name; however, the highest peak is by far Long Peak. Long's Peak is a stunning 14,255 feet high, and it is arguably the most famous summit in the Front Range north of Pike's Peak. Sunsets and sunrises backing Long's Peak and Trail Ridge are remarkable once one can grasp the sheer enormity of the range's most notable summit. Sighted by adventurer-historian Francis Parkman during his Colorado region expedition in 1846, he described the sight as, "it must thought I, be the summit of a mountain; and yet its height staggered me." Long's Peak still holds the same effect on visitors today. The real interest in preserving the region began in the early 1900s, as Congress, various clubs, scientists, geologist, historians, ranchers, railroads, and miners – anyone with an interest – all began pleading their case for or against the establishment of Rocky Mountain National Park. Meanwhile, Freelan Stanley, the inventor of the Stanley Steamer automobile and an avid backer of the park's creation, constructed the sumptuous Stanley Hotel on the outskirts of Estes Park in 1909 even before the official dedication in 1915 of the park. Today, many archival libraries, relics, photos, and historical specimens are preserved and protected within the park and its various Visitor's Centers as well as at the Holzwarth Historic Site. Discover more about the rich history of Rocky Mountain National Park through ranger programs widely available seasonally. Stand at the windy and vertiginous overlooks along the Trail Ridge Road, the celebrated 'roof of the Rockies,' to discover what panoramic really means when nature sets its mind to it. Take a moment to stretch out onto the tundra for a close look at the incredible array of tiny "belly flowers," or peruse the adjoining slopes for elk, bighorn sheep, and others – patience pays off for those who want to see the big ones. Perhaps a bit of rainbow trout fishing is in order, a scenic drive, or an exhilarating backcountry hike – whatever one seeks, the Rockies will provide. The Tundra Nature Trail offers superior wildlife viewing and bird watching opportunities, as do most of the ponderosa parklands and meadows throughout the park. Park rangers lead regular wildlife tours from the Alpine Visitor Center just off Trail Ridge Road. Spring and summer bring forth the best of the wildlife and wildflowers in Rocky Mountain National Park. Those desiring to head into the mountains, particularly during the winter season, should seek a guide. Be forewarned, much of the wildlife hibernates in winter, so viewing of fauna may be limited to certain species. However, some top higher altitude hikes begin near Bear Lake at the Foot of Hallett's Peak. Go the distance and continue to Dream Lake's tall trees and jagged peaks. Beyond that, Emerald Lake is only a short hike, but these trails are snowy most of the year, so be prepared with the right gear. Horseshoe Park's diverse vegetation and lush riparian zone attract many large mammals, especially the bighorn sheep, mule deer, coyotes, elk, hawks, and hundreds of songbird species. Most of the ponderosa prairies and meadows here teem with wildlife seasonally. Autumn is a fabulous time to see the trees change colors and to view some the some of the large wildlife like the yellow-bellied marmot before they hibernate. Other creatures like the elk enjoy their own rites of passage in fall. Known as the autumn rutting, bull elk love to lock horns and face off, putting on a show to remember for those fortunate enough to capture the event. Wintertime brings forth the serious snow, and skiing, sledding, tubing, snowmobiling, and other winter fun abound throughout the park. Ranger-led activities are a good choice to keep safe in the Rockies during the wintertime and to avoid any unwanted encounters with wildlife. Spring and summer are the high seasons at the park, and visitors will want to make their reservations for lodges at Rocky Mountains National Park as early as possible. Rocky Mountain Park Inn – Enjoy accommodations just minutes from the park entrance in Estes at Rocky Mountain Park Inn. Comfortable rooms, onsite dining, a fitness center, and kid-friendly policies and amenities make this an idyllic selection for families looking for lodges near Rocky Mountain National Park or in Estes. Aspen Winds on Fall River – A beautiful, rustic sanctuary adjacent to the rushing waters of the Fall River, the Aspen Winds on Fall River is a posh lodging at Rocky Mountain National Park. Soak in the views and the surplus of wildlife on the property from spa accommodations, the outdoor Jacuzzi, or the spacious porches of the lodge. Wildwood Inn – One of the most private lodges at Rocky Mountains National Park, Wildwood Inn is far from the bustling sector of Estes Park and offers upscale cabins, rooms, and services to complement the superior views of the Fall River.